Hello! Today I had a chance to play along in the My Mind's Eye Challenge #20! There are two challenges this month, a card and layout challenge. I ran out of time last month to make a layout, so this month, I decided to make my first project be the layout.. I have to say that I really miss scrapbooking.. I am trying to do more of it whenever I have some time to play.. It was time for school pictures again and this photo was taken last month. I usually have low expectations, but when we got Sabrina's pictures back on Monday, I was pleasantly surprised. In fact, this is probably one of the best photos of her ever! She likes to always make funny faces whenever I take pictures, so it is rare to get her natural smile. I think the photographer did a great job capturing her sweet smile. And, gosh, doesn't she look grown up?! It's hard to believe she is only 7! 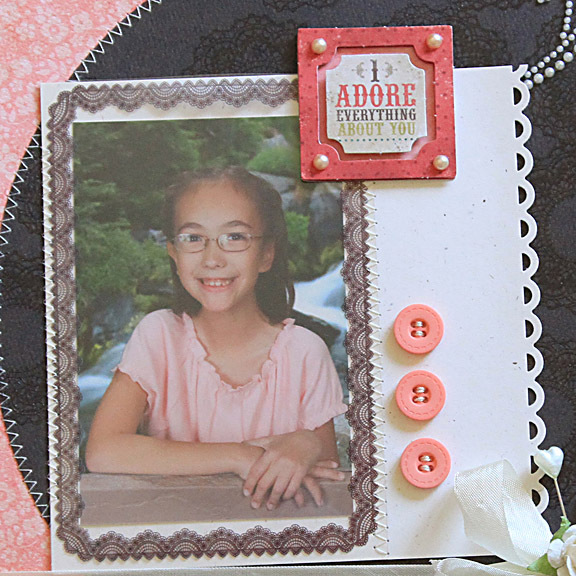 For my layout, I used various products from the My Mind's Eye Stella and Rose, Gertie collection. I started with a sheet of "Girly" Lace paper for my base. Next, I took a sheet of "Girly" Diamonds paper, traced a circle with a mixing bowl and cut it out. I thought that it was a little too plain, so I randomly stamped one of the doily images from the Gertie "Girly" stamp set using Versmark Watermark. It wasn't showing up as well as I liked, so I poured some clear embossing powder all over my circle and heat set it. Along with the sketch, the theme is Love Everything About ___________. I added a sticker (that reads I Adore Everything About You) from the You & Me layered sticker pack. For my journaling, I wrote out a few of the things that I love about Sabrina, including the last one "that you are.. My Girl". The sticker that reads My Girl is part of the "Girly" Sticker tags. I adhered it to a piece of cardstock to make it sturdier, trimmed around it and punched the corners with a scalloped corner rounder, punched a hole and tied it with twine to my ribbon as a tag. Accessories: "Little One" transparency frame, buttons, "Girly" stickers, stamps, "You & Me" layered stickers (MME); Apron Lace border punch (Fiskars), Scalloped corner punch (Marvy), Double ended banner die (Papertrey Ink), Clear embossing powder, Pearls, Pearl flourish (Zva Creative), Seam binding, Rose (Prima), Trinket pins (Maya Road), Thread, Sewing machine. Wonderful page, Stephanie! I am so behind with mine! Gorgeous photo of Sabrina displayed on such a stunning LO! Love all the pearl flourish and the sweet tag! Wow!! amazing! great idea with journaling! SHe is SO beautiful Steph!! GORGEOUS page...LOVE that my girl ticket! Oh Stephanie - she is just gorgeous! Beautiful layout! Such a lovely layout! I love how it all matches her pink shirt! This is such a pretty layout!! Lovely page - really enhances that lovely smile! Stephanie.. Lovely layout and so sweet. The picture and the journalling is adorable. Fabulous layout!!! Really gorgeous!!! I don't scrapbook right now but this sure makes me want to start!